♥Love Story♥ Elegance is not about being noticed, but being remembered. 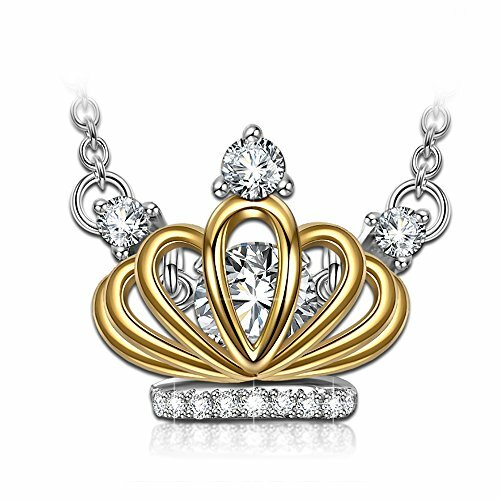 ♥Dancing Surprise♥ Inspired by the elegance of "Audrey Hepburn", the crown with hollow- carved design features 925 sterling silver and gold plated. And the top of crown is decorated with three pieces of 4A CZ. Another special detail: the stone in the middle will dance as you move, which hints the heartbeat for you. ♥Specification♥ 925 Sterling Silver; Chain 17+2 inches(44+5cm); Pendant Length 0.5inches(1.3cm); Width 0.63inches(1.6cm); Weight 3.12g(0.11oz). ♥Gift for Her♥ Comes in an exquisite box worthy of gift giving. An ideal gift for Valentine's Day, Mother's Day, Christmas Day, Anniversary Day and Birthday to your girlfriend, wife, mom and daughter. It's time to show her how much you care with this flipped surprise. ♥Customer Support♥ Your satisfaction is our unremitting pursuit. Any other quality issue, we promise to send a new one for free as replacement or make refund in your lifetime. Please feel free to contact us.